Modular, 4” square x ¼” wall structural tube main frames with continuous welds. Spark resistant, 2-ton air hoists with trolleys and nylon energy chain. 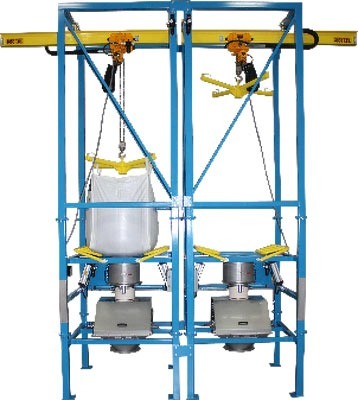 Spider-Lift™ bag lifting frames require less headroom than other designs. Flo-Master™ bag massaging systems with tubular frames break up clumps and promote material flow. Flo-Lock™ slide gates quickly close bag discharge spouts for partial bag discharge. Seal-Master™ bag spout access chambers with “gull-wing” doors allow easy operator access. Sure-Seal™ pneumatic clamping systems seal bag outlet spout to transition for dust-tight discharge. 304 stainless steel bag break stations with dust hoods, hinged access doors, interlock switches, and pneumatic turbine vibrators. Parker pneumatic cylinders and ISO compatible solenoids mounted on common manifolds deliver reliable performance. Stainless steel pneumatic tubing is standard on all MTS Bulk Bag Dischargers.